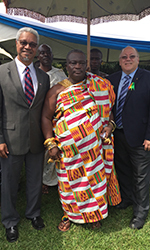 Dean J. Douglas Bricker visited Ghana in early October to attend the Silver Jubilee Celebration of Spiritan University College and to explore potential partnerships with the African pharmacy schools. Dr. Gerald M. Boodoo, Director of the Duquesne University Center for African Studies, also attended. Located in Ejisu, Ghana, Spritian University College is the only African Spiritan University and the second after Duquesne. The College was established in December 1990, and an affiliation agreement with Duquesne was signed in July 2014. The Silver Jubilee Celebration included a Mass and a ribbon cutting ceremony to dedicate the new entrance to the College. Numerous Spiritan priests concelebrated the Mass, which was attended by a spirited congregation wearing traditional African apparel featuring fabric that was specially designed for the event. Following the celebration, Drs. Bricker and Boodoo visited the home of Dr. Baffour Osei Hyeaman Bantuo IV, Chief of Ashante. They then joined the Chief for a visit to Kwame Nkrumah University of Science and Technology (KNUST) Faculty of Pharmacy and Pharmaceutical Sciences. There, they met with the Dean, Rev. Charles Ansah, and the new interim Dean Rita Dickson, to discuss the possibility of collaboration between Duquesne and KNUST. The group also paid a visit to the Pharmaceutical Sciences Department of Kumasi Polytechnic. 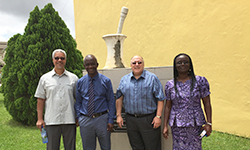 The next visit was to the University of Ghana College of Pharmacy in Legon, Ghana, which is just beginning a Pharm.D. program. "We discussed points of collaboration with them as well," said Dr. Bricker. The last leg of the journey was a visit to the U.S. Pharmacopeial Convention, which took place at the Center for Pharmaceutical Advancement and Training (CePat) in Accra, Ghana. There, Dr. Bricker said they visited with Dr. Patrick Lukulay, Vice President of Global Health Impact Programs. Dr. Bricker said that the USP monitors drug purity and stability in Africa, India, Brazil and China, and educational programs are being formed to support those efforts. "We discussed with Dr. Lukulay how Duquesne may partner with them in some of these programs in the future," he said.